Protected bike lanes — a.k.a. “cycle tracks,” or “green lanes” for the color they’re often painted — are far rarer in the United States than they are in Europe, and U.S. cities, says Christopher Monsere, a professor of civil and environmental engineering at Portland State University, are holding off on creating them until they better understand how they fit into urban traffic flow. Monsere and a team of 10 other researchers recently examined how protected lanes work in Austin, Chicago, Portland, San Francisco and Washington, D.C., and found that while Americans generally support green lanes, understanding how those lanes are perceived — by cyclists and drivers — is critical for promoting future citywide acceptance. The Portland State team talked to the cyclists, too, and across the board about a quarter of the riders said that they were riding their bicycles more because of the new presence of the protected lanes; that rate varied from 19 percent on San Francisco’s Oak Street path to 54 percent on Chicago’s Dearborn lane. 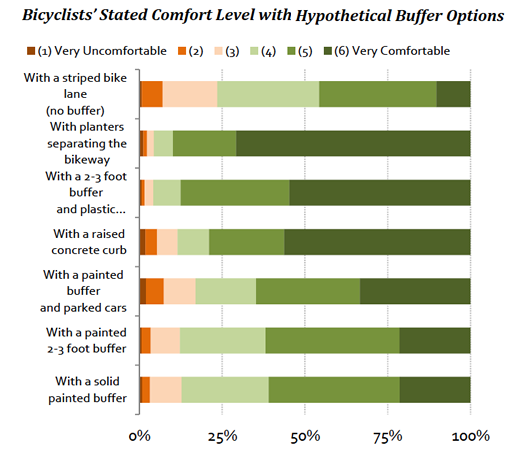 But residents, found the study, were more split on the idea that the protected bike lanes up the appeal of their neighborhoods. 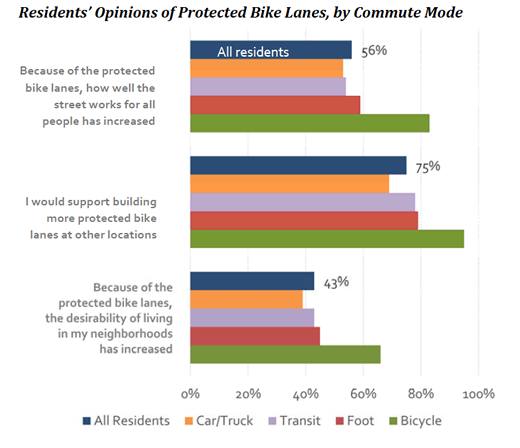 Some 43 percent of those asked said that the presence of protected lanes for cycling made their neighborhood “more desirable,” while an equal percentage said that they had no effect. And 14 percent said that having green lanes made where they live less desirable. One reason that locals might not be more thrilled about protected bike lanes is parking. Across the cities, some 30 to 55 percent of drivers reported that the lanes limited their parking options. But here’s the kicker: That occurred even in cases where the addition of the lanes has limited effect or no effect on parking. Indeed, finds the study, some 30 percent of residents around Portland’s Multnomah lane reported that “the lane made parking more difficult to find,” even though when adding the lane the city also added some 27 parking spaces. All of which serves to remind city planners that the future success of protected bike lanes in the United States doesn’t just depend on adding some green paint, but on what people think of when they see it.